Daniel Schnieder and I are on a similar journey. He recently wrote a thoughtful piece in which he discovered the domino effect while implementing Standards Based Grading. His post focused on three dominoes—standards, assessments, and grading—and how his move to SBG has resulted in a reevaluation of every aspect of teaching and learning. He concludes by suggesting there are at least 50 more dominoes in the chain. 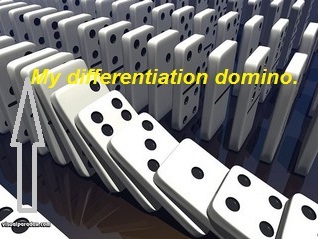 I think one of those fifty dominoes combine differentiation with formative assessment. I thought I knew differentiation—content, process, product, readiness, etc. But today I realized how much there is to learn. I watched portions of a Carol Ann Tomlinson webinar, Common Core State Standards: Where Does Differentiation Fit? and learned how the MARS project is transforming differentiation by using formative assessment to facilitate student thinking and problem solving. In the past I used formative assessment to differentiate instruction by groupings or as a reactionary tool for when students didn’t get it. If you read the previous sentence closely, I’m differentiating before or after a lesson or task. What’s different is how Tomlinson suggests using differentiation and formative assessment during a mathematical task. Here’s an example. In this MARS task students work independently for 15-20 minutes to solve and graph an inequalities problem. After the allotted time, the work is collected and analyzed based on the 8 Mathematical Practices (Not all practices may be present in the task). Is the student having trouble getting started, or misinterpreting the problem (Make Sense of Problems)? Is there an organization of thought, or is work haphazard (Construct a Viable Argument/Attend to Precision)? Did the student present a variety of mathematical models (Reason Abstractly and Quantitatively/Model with Mathematics)? The differentiated feedback is given to the student in the form of questions. Can you organize your numbers in a certain way? How would someone unfamiliar with your solution understand your work? When the students resume the task the next class period they are given 10-15 minutes to review the feedback and answer questions. They are then paired or organized into triads to collaborate—combining ideas and creating a new and improved solution. This particular task is designed for high school, but MARS has a variety of problem solving and concept development tasks for middle and high school. You can take your pick of Classroom Challenges. The mathematical tasks our math department created this year use questioning to differentiate and guide problem solving but not in the same manner. Those tasks are much more group worthy in nature and the questions are presented to the groups as resource cards to allow for multiple entry points. They both serve a purpose but the MARS example allows for differentiation based on a formative assessment, not on anticipated misconceptions. In the fall, I had planned on introducing the students to the mathematical practices and collaborative work through a series of short group worthy tasks. It will serve them better if I differentiate by using the approach suggested by Tomlinson and the MARS classroom challenges.